What Map Data Do I Need? If you are unfamiliar with map data, think first about how you want to use map data. Many project needs are met with the following common map data types. Then explore these links to learn more about map data! Base Maps--Include streets and highways; boundaries for census, postal, and political areas; rivers and lakes; parks and landmarks; place names; and USGS raster maps. Business Maps and Data--Include data related to census/demography, consumer products, financial services, health care, real estate, telecommunications, emergency preparedness, crime, advertising, business establishments, and transportation. 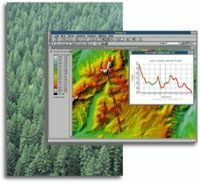 Environmental Maps and Data--Include data related to the environment, weather, environmental risk, satellite imagery, topography, and natural resources. General Reference Maps--World and country maps and data that can be a foundation for your database. How Do I Get Map Data? Fortunately, volumes of existing geographic data are readily available. Through the ArcData Publishing Program, ESRI has established a partnership with leading commercial data vendors to provide a wealth of information in a plug-n-play format for use with ArcView GIS. ESRI's GIS Store and ArcData Online both offer a convenient way to get the most popular geographic data. And, a variety of useful geographic data come bundled with ArcView GIS to help you get started quickly. In today's global community, the more information you have at your fingertips, the easier it is to make an informed decision. In today's high-tech world, information comes in many different ways, from company reports and statistics from down the hall to digital photos and multimedia from across the world. Information can be overwhelming and the need for timely decisions calls not only for innovative ways to access accurate, up-to-the minute information, but also tools to help present the information in useful ways. A geographic information system or GIS allows you to bring all types of data together based on the geographic and locational component of the data. But unlike a static paper map, GIS can display many layers of information that is useful to you. You will be able to integrate, visualize, manage, solve, and present the information in a new way. Relationships between the data will become more apparent and your data will become more valuable. GIS will give you the power to create maps, integrate information, visualize scenarios, solve complicated problems, present powerful ideas, and develop effective solutions like never before.